Parents Choose A Simple Device To Reshape A Baby's Ear : Shots - Health News Sometimes a baby's outer ear may be a tad misshapen. Surgery can help later on, but a plastic mold makes the most of the fact that a newborn's ears are pliable. They can reshape within weeks. Courtesy of Becon Medical, Ltd.
Before and after photos of an ear shaped with the EarWell device. 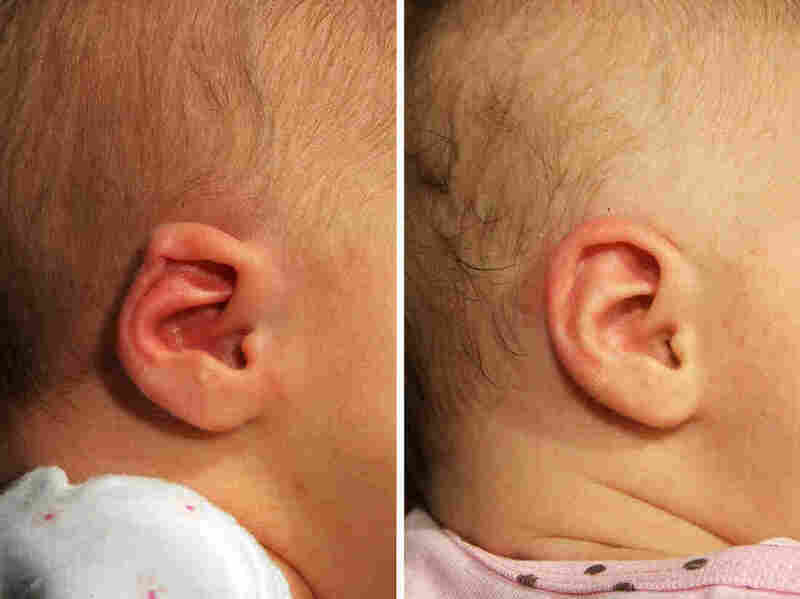 Soon after giving birth to a baby girl, Jennifer McMullen noticed that one of her daughter's ears looked a little different. "She had a condition called lidding, where the top part of the cartilage in the ear is basically folded over so the top ridge is kind of rounded over," McMullen tells Shots. Her daughter could hear just fine, but McMullen worried about bullying when she got older. "She's a beautiful baby girl," she says. "If she plays sports, I don't want her to be self-conscious pulling her hair back or anything like that." Parents have three options when their child's ear looks a little misshapen. They can do nothing and embrace a unique ear. They can choose to surgically reshape the ear, but they have to wait until the child is at least 5 years old. Or, if their child is still a baby, they can use a plastic mold to shape the ear. McMullen works as a clinical nutritionist, so she asked around and a few friends suggested a mold called an EarWell and a plastic surgeon named Dr. Melissa Doft in New York. She applied the mold, which adheres to the skin behind the ear and flattens or guides the ear closer to the head. McMullen's daughter started the process when she was just 6 weeks old. After six weeks of ear molding her ear looked like any other kid's. 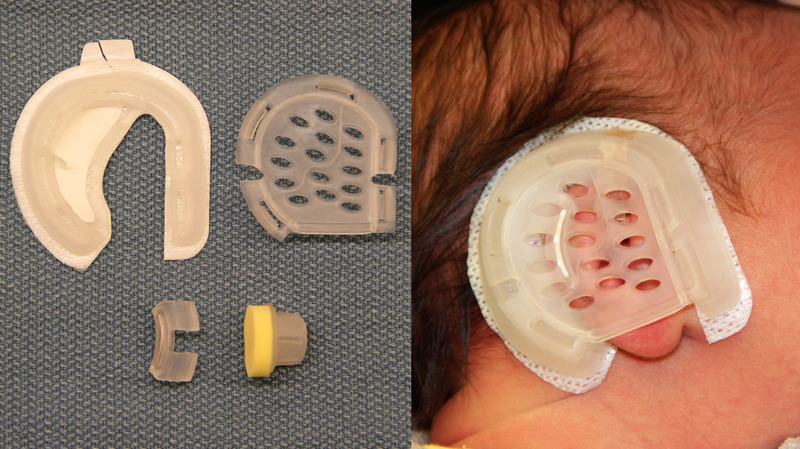 The EarWell device attaches to a baby's head with adhesive tape and is worn for two to six weeks. "It rounded out her ear and cartilage completely," says McMullen, who lives in Darien, Conn.. "And she never seemed to be uncomfortable or in pain." McMullen says her insurance company covered the majority of the cost. Doft credits the ease of the process to her patients' youth. She started applying the EarWell devices to younger babies in 2010, after reading a study showing that the cartilage is most pliable when the baby is younger than six weeks. "From being in utero the baby has an elevated level of estrogen that peaks at day three and goes down after six weeks," Doft tells Shots. The estrogen interacts with an enzyme called hyaluronidase that keeps the cartilage flexible. "The ear is supposed to be pliable during this short window," says Doft. "So why don't we take advantage of this spike in estrogen during this baby's first week of life?" Doft found that by applying an ear mold to babies at two weeks old or younger, she could shorten the treatment time from six to eight weeks to just two weeks. She reports a 96 percent success rate in her study, published today in Plastic and Reconstructive Surgery, meaning that 96 percent of the parents in the study rated the outcomes as excellent or greatly improved. The 4 percent that were unsuccessful either had ears that responded minimally to the molding or reverted once the molds were removed. Doft is careful to point out that parents have options. She says that surgery can cost upwards of $10,000 once you take the cost of anesthesia and operating room fees into consideration. EarWell costs about $3,500 for one ear. And there is another less expensive device called Ear Buddies that parents can order and use themselves. Still, she's the first to mention that there are plenty of people in popular culture who don't have the best ears, and they've still achieved a lot. There are studies reporting that people with ear deformities experience serious bullying and teasing. But the studies only ask people who have had their ears molded or surgically altered. They don't ask people who leave their ears unaltered. It's tough to find these people, Doft says, because the people who come into her office are the ones who are unhappy and want to change their ears. "I've had adults come in and say, 'This has been bothering me my whole life,' " Doft says. As for the babies, some of their parents proceed without hesitation while others deliberate. "This is the first medical decision that they have to make," she says. But Doft mentions that some of the most hesitant parents become the most enthusiastic about the procedure. "We have a lot of happy parents," she says. McMullen's daughter and her molded ears will be 8 months old next week.